Your Outcome: Get ready. YOUR world’s about to rock. You are about to become a powerful force of one. It’s time to shift from spending more time in your weaknesses to spending more time in your strengths. By spending more time in your strengths, and less time in your weaknesses, it’s like a combination of simultaneously uncorking your abilities and drinking from the fountain of youth. Finding your vital few set of strengths and spending more time in them is the single most direct way to crank up your energy and your passion, enjoy what you do, and create unique value to your world. Welcome to day 10 of 30 Days of Getting Results. In day 9, we learned how to focus and prioritize using MUST, SHOULD, and COULD. Today we learn how to refocus the time and energy we already spend away from the activities that make us weak … to the activities that make us strong. It’s time to unleash our possibilities. For some of you, this post will sing directly to your heart, as if it’s exactly what you need, right here, right now. Your going to change your world in your most powerful way ,,., you’re going to change how you spend your time and you’ll have a new lens for unleashing your best. If there is one thing to remember as you read this, it’s this … Give your best where you have your best to give. What if there was one thing you could focus on that would help you get exponential results in all areas of your life? Well there is. It’s getting on your strengths path. When you are spending more time in the activities that make you strong, you automatically do great work, you renew and rebuild your mind, body, emotions, and spirit, and you dramatically accelerate your learning and growth. Fighting to get on your strengths path is one of the highest ROI (Return on Investment) battles you will ever win. It pays you back daily. If there are so many benefits to being on your strengths path, and spending more time in your strengths, then why doesn’t everybody just do it? Because it requires self-awareness and you have to own it. Nobody comes along and puts you on your strengths path. YOU have to own it. YOU have to continuously find ways to spend more time in your strengths. Only you know truly what makes you strong and what makes you weak. You have to decide you want to spend more time in your strengths and you have to be deliberate about spending less time in your strengths. Build a firm foundation. Design how you spend your time effectively. Spend your time on your strengths. Limit your time on your weaknesses. If you get knocked down, get up again. Stay the path. Focus on finding your strengths and finding ways to leverage them. Expect a learning curve, but know that this is the high ROI path. Whenever you get rundown or feel overwhelmed and drained, there is a great chance that you are not spending enough time in your strengths and you’re not on your strengths path. To look at it with another lens, many people mistake the path of weaknesses as the growth or opportunity path. What they don’t realize is not only are they robbing from their energy, their best contribution, and their sense of fulfillment, but they are taking away from their greatest source of growth. You’ll grow faster in your strengths. In today’s world, you have to outpace your problems and give your best where you have your best to give, to succeed in any situation, flow amazing value to yourself and others, and find a sustainable way for getting results in everything you do. If you spend the bulk of your time in your weaknesses, then you are stacking the deck against you, and even if you improve your weaknesses, you will never achieve the powerful force of growing your strengths. Your strengths are your natural talents. Your strengths are what your natural patterns for how your thinking, feeling, and behavior. Your strengths are NOT what you are simply good at. Unfortunately, many of us are good at things that make us weak or drain us, so we spend more time in those. So yes, we are good at them, but no they are not strengths that give us energy or that we exponentially improve at. True strengths are your natural talent for thinking, feeling, and behavior, applied to a context.. Your strengths are what you find easy to do. The things that other people struggle with that you find very easy to do are your natural strengths. Your strengths give you energy. You can spend time in your strengths all day and actually have more energy at the end of the day than when you started. Your strengths catalyze you. They make you strong. Your strengths are where you get better faster. Your strengths are a place where you can accelerate. You grow faster in your natural strengths than in any effort that works against your strengths. Give your best where you have your best to give. When you find that, it’s your unique contribution to the world, and when you spend time in your strengths it’s your growth, renewal and passion in action. Of course, the trick is to find something where you can be the best in the world at, and the trick there is … it’s YOUR world, since it’s all relative. Light things up your way. I’m a fan of be more of yourself with skill and give your best where you have your best to give. It’s all about bringing yourself to the picture and lighting things up the best way you can. Amplify your results. It lines up nicely with what I’ve learned to be true … drive by your why, live your values, and play to your strengths … and give your best where you have your best to give. Renew yourself and lift others up. I think it’s important that you give your best where you have your best to give, otherwise, you can drain yourself. I think renewal and downtime and taking care of your own basics builds a firm foundation for lifting others up. Focus on the vital few activities where you can really give your best. Focus on strengths over weaknesses. 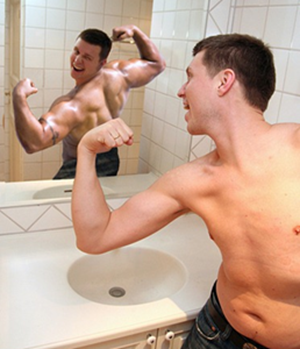 You’ll get more results by improving your strengths than improving your weaknesses. Spend less time in your weaknesses. Limit the time you spend in your weaknesses. Find ways to off load more of your weaknesses so you can spend more time in your strengths. Fight to spend more time in your strengths. Don’t let the changes around you, cause you to lose sight of the activities that make you strong. Don’t let yourself get caught up in activities that weaken you. Get back on your horse. Sometimes we get knocked off our horse. We may not have realized how beautiful the ride was or how well we were riding. We were caught up in the ride and it was great. But something changes. The ride no longer feels right and we no longer feel strong. 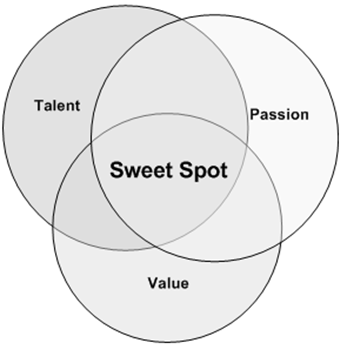 The secret of amplifying your impact and getting exponential results is finding the “sweet spot” which is the overlap of your talent, your passion, and value. Value is in the eye of the beholder. You can flow value for yourself or for others or for your company. The key thing here is that you find the strengths that give you juice and that flow value. There are many ways to find your strengths. The key is to find the activities that you look forward to, give you energy, and lift you up. Another key is to get specific. For example, maybe you can write songs all day. Maybe you can write content all day. Maybe you love to interact with customers. Maybe you like to brainstorm. 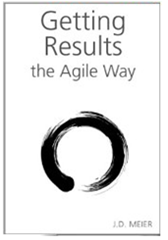 Maybe you like to solve big hairy challenges. For me, I like to make sense of meaningful problems where I can turn it into a form factor that’s easy to share and scale expertise. I find that having a language to think about your strengths can help you better. Marcus Buckingham and Donald O. Clifton, Ph.D. identified 34 key signature themes of strength. There is a brief description of each strength in the appendix of The Clifton’s Strengths Finder 2.0 Technical Report: Development and Validation. One way to use these is to take their tests and find out what they say about you. I do like the fact that they have framed and named the strengths which makes it easy to explore, test, and evaluate. Personally, I’ve found more value by simply exploring the labels and using them as lenses. I’ve been rationalizing them against the Myers-Briggs Type Indicator (MBTI) as well as my own frames for strengths, looking for underlying patterns and practices. Step 1 – Map Out Your Weaknesses. Can you identify the top 3 activities that make you the weakest? Step 2 – Map out Your Strengths. Can you identify the top 3 activities that make you strong? Step 3 – Design a Strong Week. Usually what happens is you find out that you have a scatter chart all over the week of spending time in your weaknesses and spending time in your strengths. The key is to consolidate your weaknesses so that you can either spend less time in them, get them off your plate, or pair up with other people, or find a way to enjoy them. The other key is to add more activities that give you strength to each and every day. This is the secret of renewal and boundless energy for making things happen in your life. Create a simple chart of your week with time slots to indicate whether you feel strong or weak during that time. I’m a fan of using a whiteboard, but use your tool of choice. Create a new chart of your week with time slots to indicate whether you feel strong or weak during that time block. Simply use an “S” to indicate “Strength”. Create a new chart of your week. Simply use an “S” to indicate activities that make you strong or catalyzes you, and a “W” to indicate activities that make you weak or drains you. As best you can, add activities that make you strong or find a way to do more activities that make you strong, and eliminate or consolidate activities that make you weak. While you most likely won’t be able to get rid of all the things that make you weak, now that you are aware of it, challenge yourself to get creative here and at least make it a conscious effort. Even if you can only add a few activities that make you strong, that extra energy will spill over into more areas of your week, and more areas of your life. To gamify it, challenge yourself to continuously find new activities that make you strong and are high value, and find new ways to do old activities in a way that leverages your strengths. Nobody will do this for you. This is where you rise and shine and use all your creative capability to continuously find new ways to use your strengths where it matters most. What you are really doing here is finding ways to use your best energy for your best results. Everybody has strengths and weaknesses. Strengths are not simply what you’re good at. Strengths are what you naturally think, feel, or do. Spend more time in your strengths. Schedule it. If you schedule it, it happens. If you don’t, it won’t. Own it. Only you can do this. Only you know what your strengths are. Do less of what makes you weak. Energy can come from your mind, body, emotions, or spirit. By spending less time in your weaknesses and more time in your strengths, you renew, rebuild, and rejuvenate your mind, body, emotions, and spirit … it’s your multiplier. You have to own getting on your strengths path. Find the specific things you want to spend more time doing each day – the things that make you STRONG. Find the jobs, tasks, and activities that are directly related to your strengths. Find creative ways to change how you do what you already do to gradually integrate more of your strengths. Your little wins will add up. Find your strengths and write them down in ways that sing to your heart and put precision on what truly makes you strong. Your done when your list feels like a short-list of your super skills. Map out your strengths and weaknesses. Find creative ways to eliminate, consolidate, or reduce the activities that make you weak, and find a way to spend at least one more hour per week in something that makes you strong. Trade-up spending time in your weaknesses in favor of spending more time in your strengths.